What Does 'Mele Kalikimaka' Mean? As Christmas draws nearer, the debate surrounding seasonal music intensifies. Should we listen to it? When is it OK to start? Is it actually making us crazy? Which songs are too creepy for radio play? One song largely absent from the discussion is “Mele Kalikimaka,” a delightful -- albeit slightly white washed (an actual Hawaiian person probably should have been the one giving the world lessons in well, Hawaiian) -- little ditty about spending Christmas in Hawaii. The song was written in 1949 and sung by Bing Crosby, the same dude behind “White Christmas,” “Winter Wonderland,” “I’ll Be Home for Christmas,” “It’s beginning to Look Like Christmas,” “Rudolph the Red-Nosed Reindeer,” and more popular holiday jams. “Mele Kalikimaka” is significantly less popular, and overplayed, than the other songs we just mentioned. You probably won’t hear it blaring over the loudspeaker at your local supermarket as you make that last minute food run, which is actually what makes it great. The last time you heard it was probably during that scene in Christmas Vacation when Clark Griswold is fantasizing about putting in a pool. 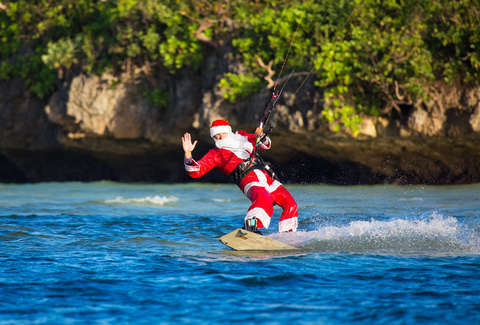 So, what does “Mele Kalikimaka” mean? Allow us to explain. What does Mele Kalikimaka Mean? Mele Kalikimaka is not just a catchy title for a Christmas song. It’s actually how you say “Merry Christmas” in Hawaiian. Though we should note, according to this YouTube video from a linguist, Kalikimaka doesn’t translate directly to “Christmas” because it’s a distinctly English word and the Hawaiian language has a few complex rules about consonant placement and a lack of replacements for certain sounds. Need a little help pronouncing it? We’ve got your back. It’s: Meh-le Keh-liki-makah. You’re officially ready to spend the holidays lounging on the beautiful beaches in Hawaii -- just promise you’ll take us with you. What are the lyrics to “Mele Kalikimaka”? “Mele Kalikimaka” is set to an instrumental that’ll make you feel like you’re sitting under the warm Hawaiian sun. Unlike most music associated with the season, it lacks references to Santa Claus, reminders that it’s absolutely freezing outside, and any of the creepy pushiness of “Baby, It’s Cold Outside.” As The Atlantic points out, it actually comes off as sort of humblebrag. A very Merry Christmas, a very, very, very Merry Merry Christmas to you. “Mele Kalikimaka” is a sung by the original King of Christmas music, Bing Crosby. Although he’s the voice behind the song, it was written by R. Alex Anderson. So, whether you’re spending the holidays in Hawaii (jealous!) or just wish you were, you now know how to wish the world a Merry Christmas in Hawaiian or, at the very least, have another song to add to your holiday playlist. Oh, and sorry for getting it stuck in your head. We’ve got you covered for everything Christmas. Dinner get ruined? Here are the best chain restaurants open on Christmas, plus a list of Fast Food open if you need a quick bite in between holiday parties. Here’s where to go if you need list minute gifts. And here are the answers to all those questions about Christmas that you’ve been too afraid to ask all these years.